Dimensions 17 inches H. x 12 inches W.
Additional Information: Salampasu masks are easily identified by their bulging foreheads and balls wound of reeds which make up the headpiece and dangle from the chin. This is a strong piece of art with a domed forehead, a strong nose and a pointed chin. Copper sheeting is woven over the face., and balls hairstyle. 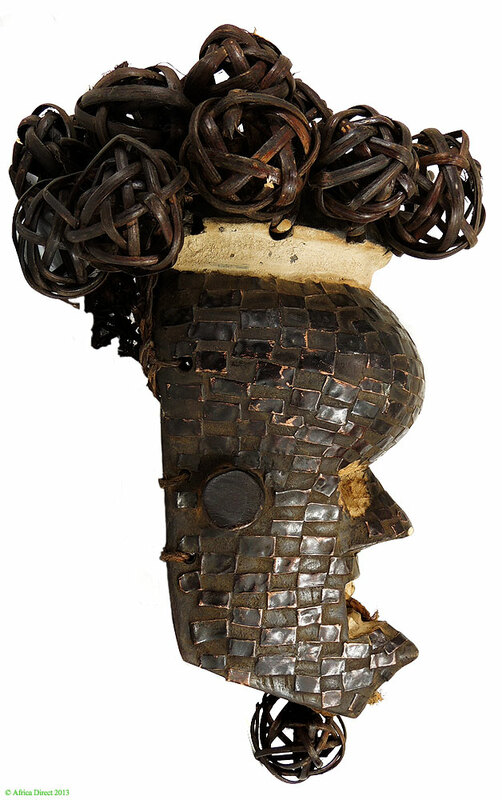 The raffia netting work to the back holds the face and the coiffure. The balls are made of reeds, and the rope in chin is handmade with raffia fibers. 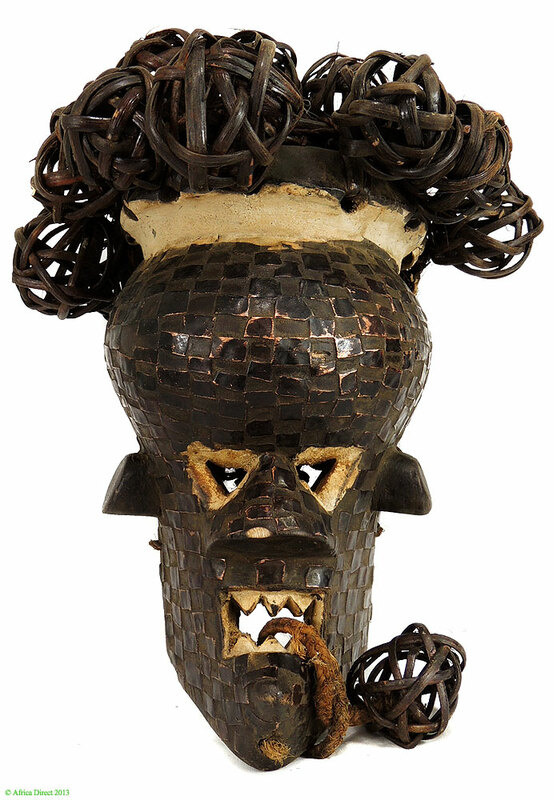 Masks among the Salampasu are known under different names, Munkika, Kasangu and Mulandwa. This one is a Kasangu mask. All these masks were worn during initiation into the men’s warrior societies Idangani and Ibiku, during funeral ceremonies for dignitaries and in Boys' initiation and circumcision rituals. The dancer of this mask wears a knitted costume and holds a knife and antelope horns in his hands. See photo in Elisabeth Cameron (1988:34). The Salampasu people who live east of the Kasai and on the upper western reaches of the Lulua River in the Democratic Republic of the Congo and even flow over into Angola. They have had long term contact with the Lwalwa to the north and to the south the Lunda who they recognize by paying tributes to them. The Salampasu are best known for their powerfully aggressive masks covered with copper sheeting or with prominent carved scarifications patterns on the face. This mask is considered a classical and well-known style with the bulging forehead, deep undercut eyes and the strong rectangular mouth showing carved teeth. The face is covered with tiny copper sheets. 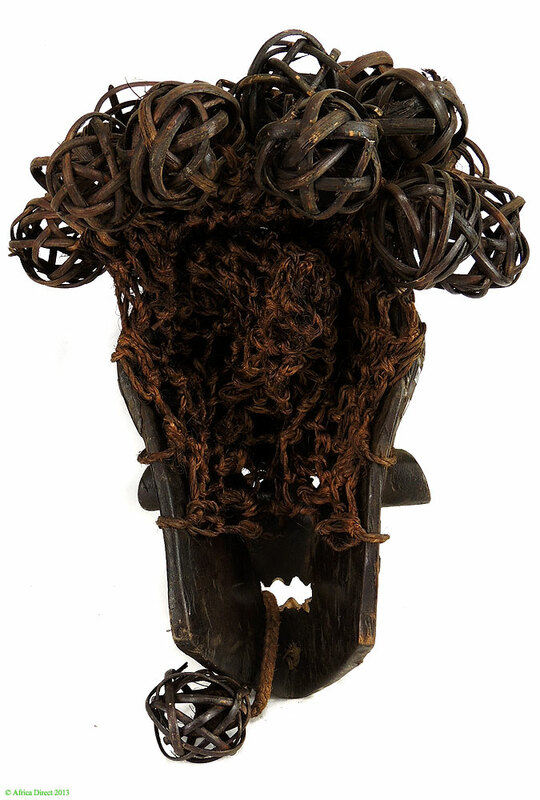 The headdress with balls wound of reeds is typical of the Salampasu masks.